Here is a selection of 20 of the gallery's most beautiful interpretations of the fall season in New England. Just scroll down to see each painting. Signed "W. LESTER STEVENS N.A." l.r. Watercolor 20 x 27 in. Born in Rockport, Massachusetts, Stevens spent four years at Boston's Museum of Fine Arts School, where he studied under Edmund Tarbell, among others. Primarily an oil painter, he also used watercolor and acrylics. He is best known for his post-impressionistic landscapes. Throughout the course of his long career, Stevens taught, first in Rockport, then at Boston University (1925-1926) and Princeton (1927-1929), and during the Depression at Grand Manan. He was a National Academician and a member of the American Watercolor Society; a founding member of the Rockport Art Association; Springfield, MA Art League; Guild of Boston Artists; Gallery on Moors; New Haven Paint and Clay Club, CT; Gloucester Society of Art; North Shore Art Association; Boston Watercolor Club and the New York Watercolor Club. He won art awards at the Corcoran Gallery, Washington, DC; American Watercolor Society; New Haven Paint and Clay Club; Springfield Art League; Salons of America; Washington Watercolor Club; North Shore AA; Rockport AA and more. He painted USPO murals in Dedham and Rockport, MA, the Boston City Hall, the Louisville, KY Art Museum and several schools in Boston. References: Movalli, Charles, American Artist (April 1986); Who’s Who in American Art (1947); Who Was Who in American Art (vol. 3, p. 3171-72). Harrison Bird Brown was born in 1831 in Portland, Maine, and is best known for his White Mountain landscapes and marine paintings of Maine's Casco Bay. By 1860, Brown was being praised as a leading American marine painter. Landscape painting was popular in the mid 19th century, thanks in part to the influence of Charles Codman (1800-1842), whose paintings were collected for their very romantic sentiments. It is possible that Brown saw examples of Codman's poetic paintings, and was influenced by his works. Brown was one of the early artists to paint the coastline of Maine's Monhegan Island, where he depicted the headlands as awesome, mystical forces. Humanity versus nature, and the human relationship to nature, themes prevalent in mid and late-19th century literature and philosophy, figured frequently in his seascapes. 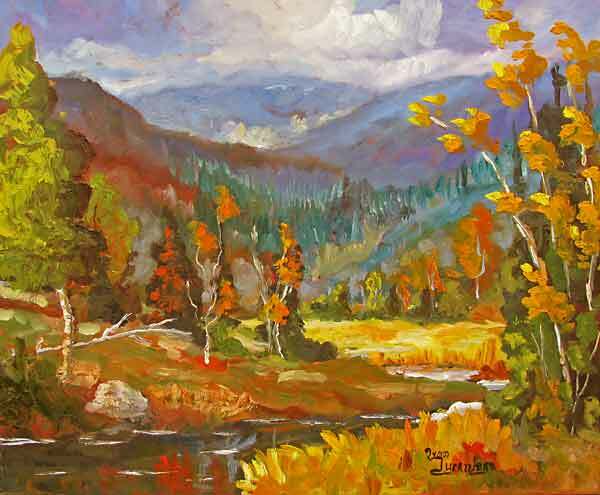 He often painted in the White Mountains, and his name can be found in the guest registers of many places artists frequented in those mountains. 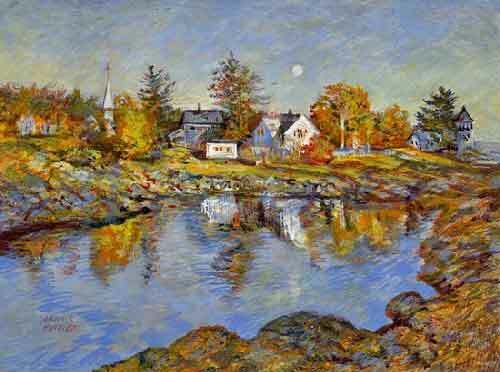 The coast of Maine was also a favorite painting venue of Brown's for over thirty years. He depicted the wholesome outdoor environment of the state, with special fondness for the Casco Bay area and Grand Manan, an island off the New Brunswick, Canada coast. Brown also produced two widely distributed illustrations of Crawford Notch for the Maine Central Railroad in 1890. Harrison Bird Brown exhibited at the National Academy of Design in New York from 1858 to 1860, and at the Boston Athenaeum and Philadelphia Centennial Exposition in 1876. By 1892 he had become the best known native Maine painter of his time, and gained fame for himself and the state with a large canvas in the Maine pavilion of the 1893 World's Colombian Exposition in Chicago. In 1892 he was elected president of the Portland Society of Art. That same year, however, he moved to England to be with his only surviving child, a daughter, and spent the last twenty-three years of his life there. Most of his paintings were completed in New England before he moved to London, but he continued to paint until his death in 1915. Harrison Bird Brown's works can be seen at the Peabody Museum in Salem, Massachusetts and at the Portland Museum of Art. Signed lower left "Bruce Crane. N.A." Robert Bruce Crane was born in New York City on October 17, 1857. The son of Solomon Bruce Crane and Leah Gillespie, he was educated in New York's public schools and was exposed to the city's galleries and museums by his father, himself an amateur painter. By the age of seventeen, Crane had moved to Elizabeth, New Jersey, where he was employed as a draftsman by an architect and builder. He soon decided to devote his career to painting, and about 1876 or 1877 sought the guidance of the landscape painter Alexander H. Wyant, with whom he subsequently shared a close friendship until Wyant's death in 1892. Between 1878 and 1882, Crane attended the Art Students League in New York and traveled to Europe for further study. In the United States during this period, he painted in New Jersey; East Hampton, Long Island; and the Adirondacks. 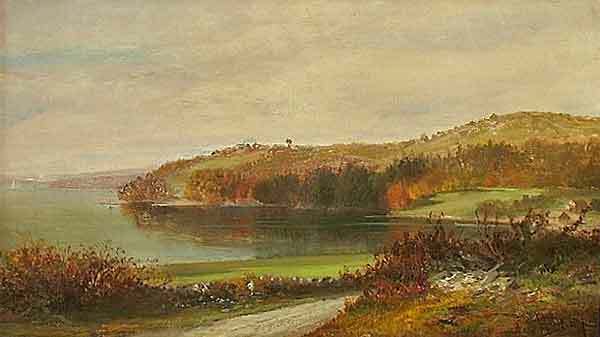 He wrote to his father from the Adirondacks that among the influential painters working nearby at the time were Eastman Johnson, George and James Smillie, and Samuel Coleman, and he described the dramatic terrain: "Went to the famous Rainbow Falls which several artists have tried to paint . . . Wyant and Hart among them . . . over the top comes tumbling the water which strikes every few feet throwing a spray which catches the sun giving a most charming as well as wonderful appearance." Crane spent time in East Hampton, on the eastern end of Long Island, during the summer of 1880 or 1881 and possibly during other summers. From there he wrote his father that the painters "Stimson, Dellenbaugh, Moran, Robbins and Coleman are here . . . I have finished the study of an old house . . . and the artists say that [it] is exceedingly good." In another note he described some of his typical subjects at this time: "I have been working on a 20 x 30 [inch] subject, a row of apple trees, gigantic in size . . . I commence in a few days the study sheep." In these early works, Crane painstakingly reproduced the pastures, hayfields, and barnyards of rural East Hampton. A critic later remarked that "Troubled or placid skies, the bright luminous atmosphere of a summer's day, or the gray tones of autumn were given in these pictures, not only with truth to nature and a certain poetic sentiment, but with a brilliant sparkling quality of effect. Clark, Charles Teaze; "Bruce Crane, Tonalist Painter", Antiques Magazine, November, 1982. 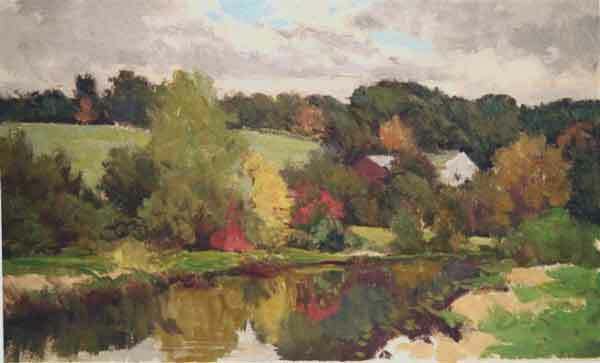 Bernard Corey is one of New England's most beloved landscape painters of the 20th century. He executed paintings surely en plein aire with accuracy and competence. Memberships included the Rockport Art Association, Salmagundi Club, the Guild of Boston Artists, North Shore Art Association and more. Having won over 100 awards and honors, including awards at the North Shore Art Association, Rockport Art Association, Salmagundi Club, NYC, Hudson Valley Art Association, Providence Water Color Club, Allied Artists of America and many more. 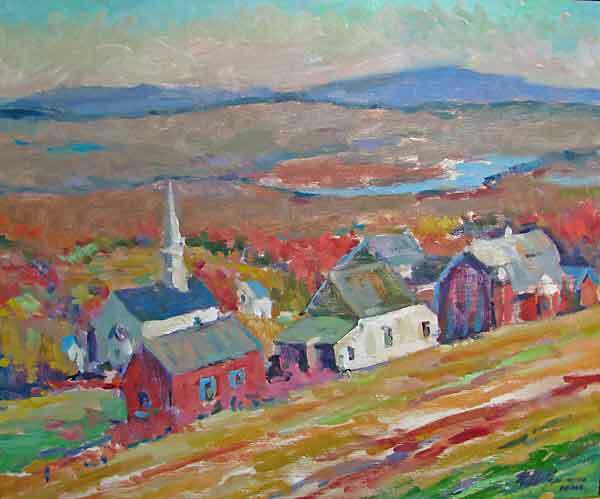 He painted almost every day of his life with fellow artists in the fields, along the streams and beaches and in the mountains in and around New England. Although the artist traveled throughout the world, Paris made little impression on him. He was American through-and-through. 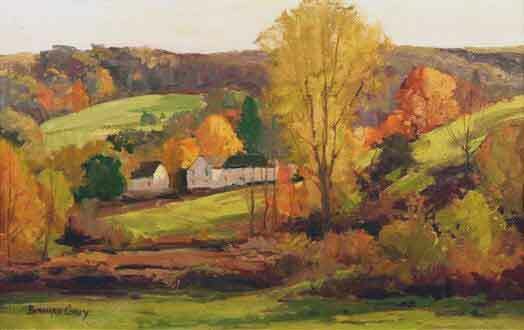 Bernard Corey was the "last of the old school" of traditional New England landscape painters. When he died early in 2000, the era when artists painted for ten hours a day, every day with competency came to an end. Corey's carefully painted impressionistic plein aire canvases captured the essence of nature in all four seasons. The Rockport Art Association gave Corey a retrospective exhibition (October-November 2000) saluting the artist's profound understanding of nature and painting. oil on board 9x14, signed Bernard Corey, l.l. Oil on linen, 20" x 31"
Oil on linen, 11" x 19"
Lorraine Lans paints the Maine coast en plein air in the Impressionist tradition. She studied with master Impressionist painter Henry Hensche at the Cape School of Art in Provincetown, Mass. and at the Fenway Studios, Boston. Originally from Massachusetts, Lans has lived in Maine for twenty years painting landscapes on Monhegan Island and in the fishing village of Stonington. Her many awards and exhibitions include top prize at the prestigious Academic Artist’s Association’s 57th national exhibition in 2007, national juried shows at the Salmagundi Club, NY, the Ventura County Maritime Museum, CA, the Boston Athenaeum, the "Salon International 2004" a 2005 exhibition at Greenhouse Gallery of Fine Art in San Antonio, Texas, where art is chosen for excellence in realism. She was awarded a residency at Acadia National Park and her work has been selected to hang in the Governor's Mansion in Augusta, ME. Her work is published in the volume A Gallery of Marine Art and she has been featured in articles in the Cape Cod Review, Ellsworth American, Waterville Sentinel and Manchester Journal. 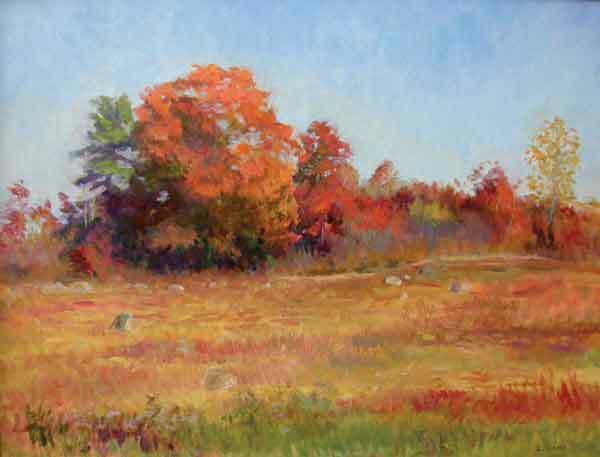 Bernard Corey is one of New England's premiere landscape painters. He executes paintings surely en pleinaire with accuracy and competence. Memberships included the Rockport Art Association, Salmagundi Club, the Guild of Boston Artists, North Shore Art Association and more. 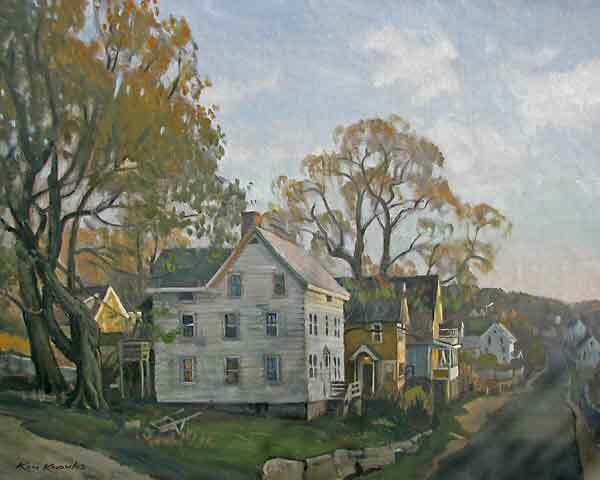 Having won over 100 awards and honors, some include awards at the North Shore Art Association, Rockport Art Association, Salmagundi Club, NYC, Hudson Valley Art Association, Providence Water Color Club, Allied Artists of America and many more. 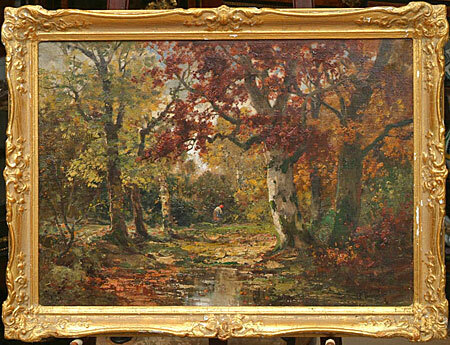 signed lower right "P. Dumont"
This post-Barbizon era painting is reminiscent of the extraordinary forest interiors painted on site in the forest of Fontainebleau by the first generation of Barbizon painters, particularly Rousseau and his pupil Diaz de la Pena. Born in the country village of Saint-Malo, in the Eastern Townships southeast of Montreal, Yvon began drawing and painting nature from an early age. 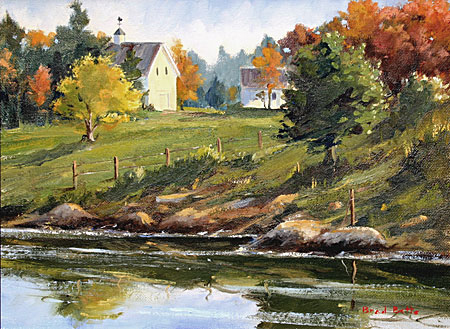 Largely self-taught, he is inspired by past masters of the Quebec landscape, Fortin and Suzor-Cote. He travels throughout the province from his home in Coteau-du-Lac painting primarily in oil and concentrating on the villages and landscapes of his native Quebec. He has won numerous awards over the past 30 years and exhibits in galleries throughout Canada and the US. Gilded antique frame, 22" x 26"
Charles Gruppe was born in Canada, and moved to New York State was he was ten. 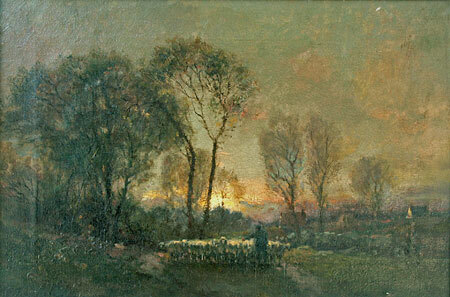 Primarily a tonalist landscape and marine painter, Charles Gruppe was largely self-taught although he spent time studying in Europe, eventually settling in Holland for a time where he developed his skill at subtle coloration and careful draftsmanship. Charles Gruppe returned to America becoming a painter and well as a dealer. His son, Emile, who became a famous painter himself, was born in 1896. In 1925, after seeing a number of Rockport and Gloucester harborscenes painted by Frederick Mulhaupt at an exhibition in New York, father and son traveled to the Cape Ann area of Massachusetts. They fell in love with the location, set up studios and painted there for the rest of their lives. The Gruppe family studio remains there to this day. 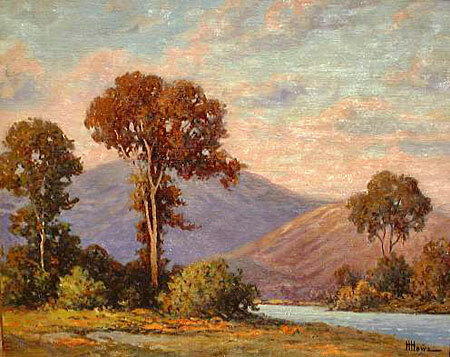 Charles Gruppe exhibited at the National Academy of Design (NAD), the Pennsylvania Academy of the Fine Arts (PAFA), the Boston Art Club, and also in Paris where he won a gold medal at the Rouen Exhibition. His paintings are included in the collections of the National Gallery, the Brooklyn Museum of Art, the National Arts Club, the National Gallery in Canada, the Queen of Holland Collection, and in the Art Museum in Rouen, France. Vivian Walker studied Art at Sir Williams College of Art, Montreal, Quebec. She had several successful Exhibitions between 1943 and 1962. She had 4 paintings at the Canadian Exhibition in Washington D.C. in 1954. Which were very well received with positive accounts in the press. She was Honorary Treasurer of the Woman’s Art Society of Montreal. This Impressionist forest scene was most likely done in and around the Laurentians, north of Montreal. Her strong use of color gives this work a lyrical and evocative qualities associated with 19th century French works, while maintaining a distinctive North American flavor. Signed "Wayne Morrell" l.l., titled and inscribed "Collection of LISA A. MORRELL fromWayne Morrell, SEPT. 10, 2000, IPSWICH RIVER GOLDEN SUNSET, 1975, MY FINEST OF THAT YEAR." Oil on board, 24 x 36 in. (61.0 x 91.4 cm), framed. Wayne Beam Morrell was born in New Jersey in 1923 and as a young child took an immediate liking towards drawing. As a result, he attended the Philadelphia School of Industrial Arts studied draftsmanship and commercial art. Morrell worked as a commercial artist and served in the United States army during the Korean War. After the war, he began painting in 1953 with great success and subsequently left his career as a commercial designer to devote his energy full time to the fine arts. Since then he has exhibited his impressionistic works internationally to great acclaim. Drawing from his personal life and everyday surroundings gave Morrell greater depth and understanding of his home in New England and these works are what he is best known for. Morrell was a member of the celebrated Rockport artist colony and he is one of a premier group of American artists who continue the this regional tradition of great landscapes. Morrell is a member of many artists associations including the American Artists, and the Rockport Art Association. His art can be found in the Butler Institute of American Art, the Columbus Museum of Fine Art, the American Watercolor Society, the Vermont Art Association, the Rockport Art Association, and in private collections throughout the United States. Dennis Poirier grew up in Gloucester, Massachusetts. He began his studies Butera School of Art in Boston, then returned to Cape Ann to study with John C. Terelak and Ted Goerschner at the newly formed Gloucester Academy of Fine Arts. Later he moved to New York City to study at the Arts Student League winning the Charles J. Romans Memorial Award at his very first national exhibit at the Allied Artists of America Show. Dennis is a member of many prestigious art associations including the Oil Painters of America, North Shore Arts Association,Rockport Art Association, the Copley Society of Art (a Copley Artist), the Hudson Valley Arts Association, and the Academic Artists Association. 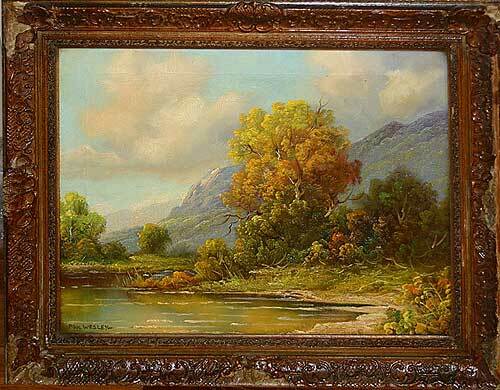 Fine oil on artist board painting of a New England river scene by listed American artist, Harry Hambro Howe (1886-1968). Harry H. Howe was the son of T. Bailey Howe who is well known (T. Bailey) as an early 20th century New England painter known for his paintings of clipper ships and harbor scenes. His son, Harry H. Howe lived in Maine and he also painted New England scenes, clipper ships and Nantucket scenes. 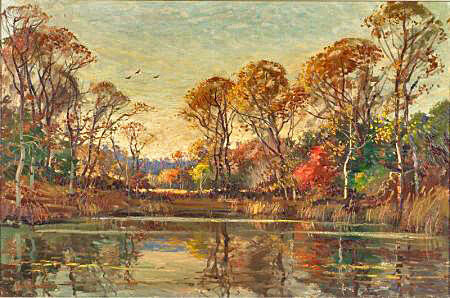 H. H. Howe is listed in Davenport's and there is a lot of biographical information on this artist at www.askart.com. This oil painting is in very good condition and there are some vibrant colors and nice evening light with lots of shades of pink and blue in the sky. 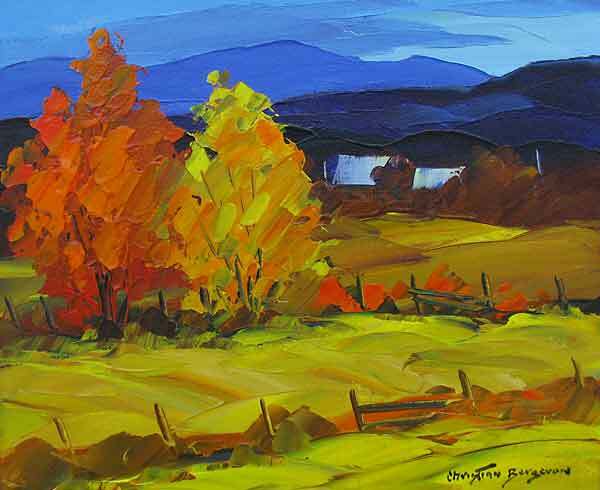 Christian Bergeron was born in 1945 in Charlevoix,Quebec, and developed his talent for figurative art at a very young age and has been earning his living with his art since the age of 20. Influenced by Impressionists, his mastery of colors is very distinctive. His skillful use of spatula has made him a well-known artist. 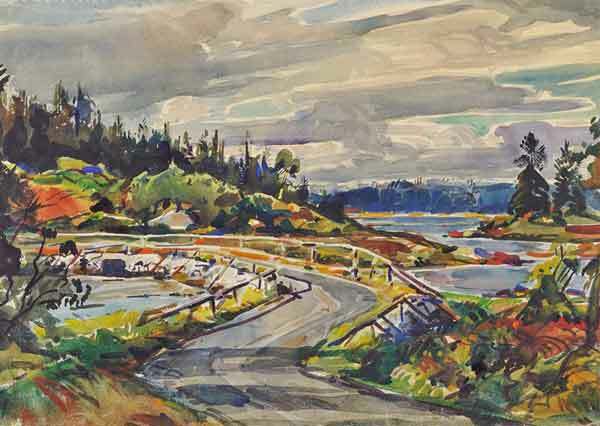 His works are sold in galleries from Halifax to Vancouver; and can be found in many corporate collections. 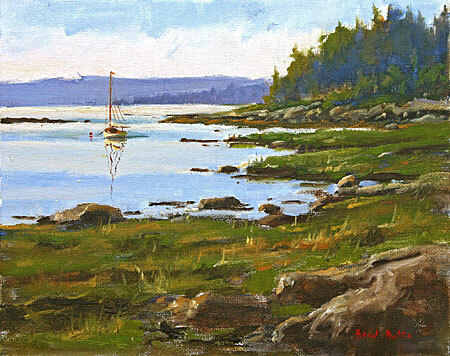 Brad Betts paints a variety of landscape scenes from Maine seascapes, farm life, fishing and sailing, to historical maritime scenes as well as floral still life. Brad has been an artist for over 15 years and received his education from the University of Maine in Orono. Oil on canvas, 12" x 16" Condition: Excellent. Born in Brooklyn, New York, Charles Appel is known for romantic landscapes and marine paintings in Tonalist and Impressionistic styles.He was a pupil of Francis Luis Mora and William Merritt Chase at the New York School of Art and of Frank Vincent DuMond at The Art Students League. 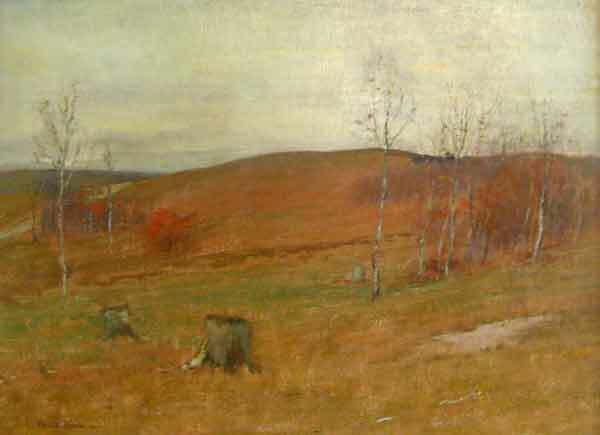 The major influence on his career, however, was George Inness. Most of his life was spent in East Orange, New Jersey from where he was active in New York art circles and was elected a member of the Salmagundi Club in 1906. 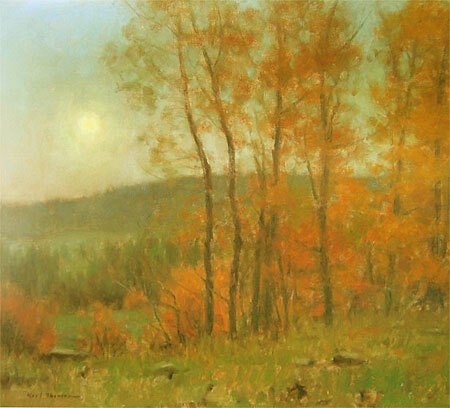 Widely acclaimed for his plein air compositions of the Grand Canyon of Arizona, The Grand Tetons of Wyoming and Wasatch Mountains near his Utah home, Karl Thomas acknowledges the influences of Inness, Sargent, Bierstadt and Moran on what he describes as his own style of "realistic impressionism." Early inspiration at his father's easel led to art studies at Brigham Young University, where he graduated in 1982, and the Los Angeles Art Center. Karl Thomas is represented by major galleries from California to New York and has been included in the Collectors Sale in Dallas and the American Art Classic and Texas Renaissance Sale in Houston. He was featured in the January/February 1990 issue of Art of the West and was selected in the top 100 artists in the Arts for the parks Exhibition in 1995. See the calendar for future exhibitions.